Your Republican Convention Sidebar: Former Harvard national security analyst Harvey Simon predicts grim future with Trump in the White House. New torn-from-the-headlines novel gives ground-level view of NATO retrenchment, Muslim ban, mass deportations, border wall and more. How can the Post have a Muslim reporter covering the White House? She’s got such a conflict of interest, it’s totally unbelievable. With Donald Trump about to become the Republican nominee for president, everyone is asking: Would a Trump administration ruin the country? Now there’s a way to know. 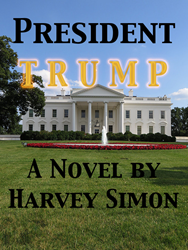 A new novel—President Trump, by Harvey Simon—is a realistic look at what may well lie ahead for the nation. Simon, who lives in Washington, D.C., has written for The Los Angels Times, The Boston Globe and The Huffington Post. He is a former Harvard University National Security Analyst. President Trump is ripped from today’s headlines—even the recent Brexit vote and the Dallas police shooting are part of the story. Only an e-book can provide this type of immediacy. President Trump is available exclusively as a Kindle book on Amazon. President Trump is told from the perspective of characters who experience the administration’s policies firsthand—and from the president’s own vantage point. A Latino family sees its solid, middle-class existence torn apart when the administration’s new Deportation Force begins rounding up the first of millions of illegal aliens to be deported. At Roosevelt High School, in Los Angeles, a social studies teacher who draws parallels in his class between Nazi Germany and Trump’s America sees more and more empty seats in his classroom and becomes an anti-Trump activist. For a white nationalist, the administration’s policies are the answers to his prayers, though he struggles to convince a more idealistic associate who complains the administration does not back some of their policy goals, such as establishing the Fourth Reich in America. After President Trump’s ban on most Muslims entering the country opens the door for attacks on Mosques, Muslim-owned businesses and individuals, a young Texas couple, both adamant Trump supporters, witness this hatred first hand, each coming to terms with it in their own way. Also in Texas, a Muslim couple gets swept up in the wave of hatred. Meanwhile, in Washington, the president tries to make a deal with Europe—a NATO member is facing Russian invasion—that threatens to turn that historic alliance on its head. But first he must face down a Washington Post newspaper reporter, and the paper’s owner, who are about to run a story that threatens to scuttle the deal. Professional reviewers may request review copies with company e-mail address. See attachment for sample chapter, which is also available on Amazon.